Rolling Hills Zoo is mourning the loss of one of its animal family. According to the zoo Frank, the mandrill, passed away on Monday. 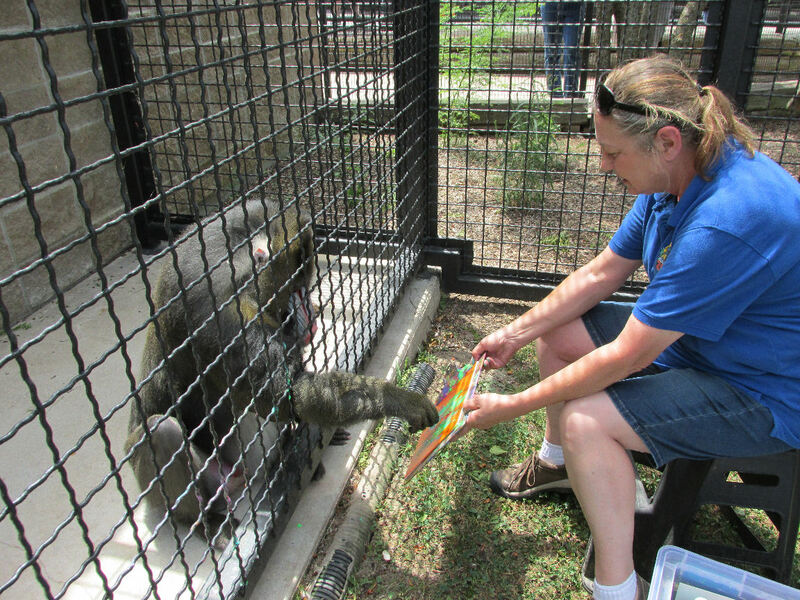 Frank was a beloved member of the Rolling Hills Zoo family and one of the zoo’s signature artists, and the only one who created his art through finger painting. Frank enjoyed finger painting as an enrichment activity, often painting himself as well as the canvas, by rubbing the scented paint onto his chest and chin as an olfactory sensation. Born October 14, 1996, Frank has called RHZ home since May 1999. He was one of the original mandrills when the zoo opened, along with his half-brothers Jesse and Doug, otherwise known as the James Gang. Doug, the oldest, left the zoo in 2008 on a breeding recommendation by the Species Survival Program (SSP), and Jesse, the youngest, left the following year. Mandrills, the largest and most colorful of all monkey species, reach full maturity as males based on their rank within the group. With the absence of his half-brothers, Frank came into full maturity with his beautiful facial colors of vibrant reds and blues. His companion Julie, now 24 years old, joined Frank at RHZ in March 2009. Due to reproductive issues of the pair, he never sired offspring, but they were a great match otherwise. Julie was very protective of Frank and often bobbed at staff if they focused too much attention on him. Frank, one of the zoo’s featured painters, will be greatly missed by Rolling Hills Zoo staff, visitors and those who loved his signature artwork. Mandrills are listed as a Vulnerable species on the IUCN Redlist (International Union for Conservation of Nature).